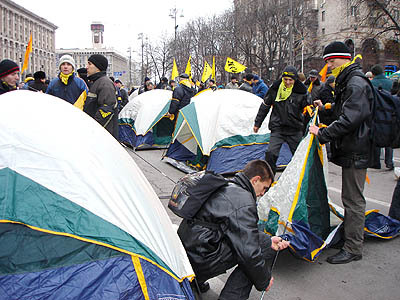 In this difficult time, when Ukrainian nation is choosing its future, young activists of PORA campaign appeal to the representatives of international community, who currently stay in Ukraine ­ to international observers, foreign journalists and diplomatic corpse. .
Today Independence Square and Kreshchatik became the only land of freedom and justice in the huge ocean of falsifications, repressions and lawlessness. Here today the tents were put by those, who are brave enough to stand up against regime and who are ready to defend their choice to the victorious end. The frosts will not stop us, hunger and discomfort of the street life will not stop us. But we do not want conscious and free Ukrainian youth to become the victim of the authorities’ provocations and to experience the harsh consequences of coercive scenario that was elaborated by officials, who lost these elections and have nothing to loose. COME TO THE INDEPENDENCE SQUARE IN KYIV! Your international status could be the last resort, which could stop provocations and coercive scenario of the development of events. It is TIME to act, TIME to struggle, TIME to win together!! !